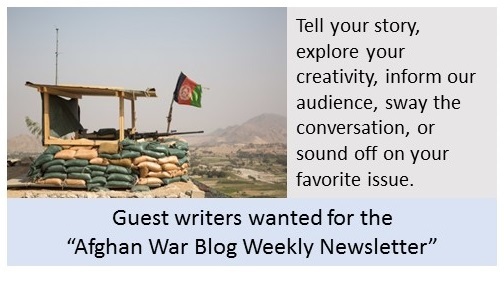 The Afghan War Blog Weekly Newsletter encourages those who have an opinion or story to tell about Afghanistan to share it with our audience. Topics can be wide-ranging as long as it relates to Afghanistan. Writings on issues concerning security, governance, politics, development, gender, culture, history, society, peace negotiations, corruption, and more are welcomed. Our newsletter subscribers are a varied group of individuals from around the world with an association with many different organizations to include the military, government, NGOs, and academia. Our editorial staff will work with you to polish up your article should your writing or English skills need some assistance. Send your ideas to staff@afghanwarnews.info.